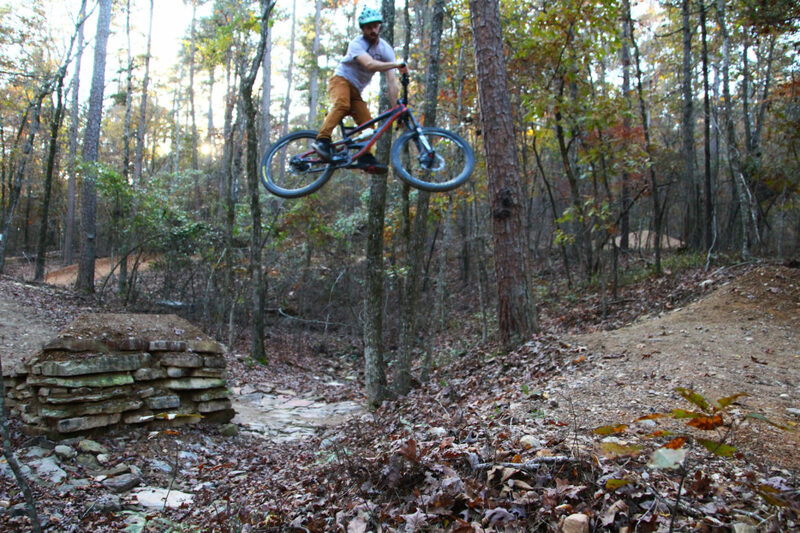 Andrew Marcum logging some air time on Big Gap jump! 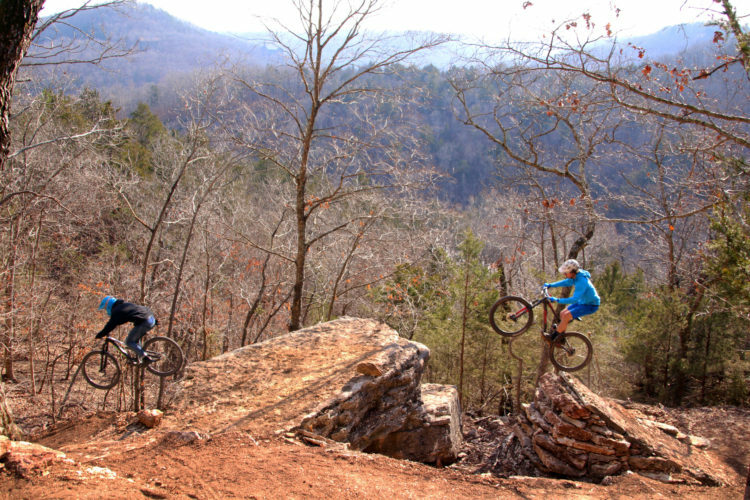 As if having three IMBA Epic trails within a 30-mile radius wasn’t motivation enough for mountain bikers to visit the area, Central Arkansas is upping the enticement with development of the new Northwoods MTB Trail system in the city of Hot Springs. Dave Wiens telling the story behind the Backwoods Trails. And you know this isn’t just another dirt bike path rambling through the woods, not when Dave Wiens, Executive Director of IMBA, and Gary Vernon, Program Officer at the Walton Family Foundation (which provided a matching grant to the Visit Hot Springs organization to fund the trails), show up at the trail’s grand opening for Phase I. That alone should tell everyone this trail is definitely something special. 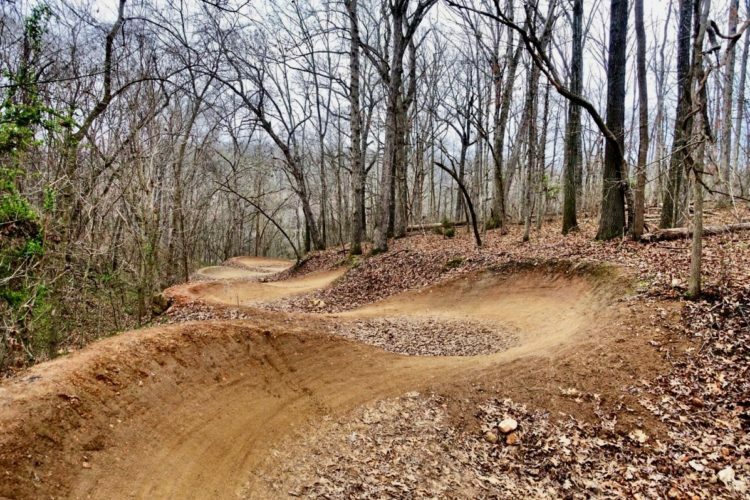 Hot Springs has been an entertainment hub for over 100 years, so when the city decided it was time to build new bike trails they set out to do it right. They demonstrated this by bringing in Trail Solutions, one of the most well known trail building organizations, to construct the trails. The city also hired Traci Berry as a full time Northwoods Trails Coordinator to manage the project. When complete, the trail system will cover the 2,000 acres of Hot Springs’ city water works property, which is comprised of beautiful dense forest, three lakes, and secluded rolling hills. At one time the annual Attila the Hun MTB Race was held on the property, however after 9/11 the acreage was closed to the public for fear someone would tamper with the city’s water source. With the acreage no longer providing drinking water for the city it has been reopened to the public. There were speeches, big thank-yous to sponsors who made everything possible, and glasses of champagne. Then, with a snip of the giant scissors, we mounted our carbon steeds, anxious to enjoy the early Christmas present Hot Springs gifted to area mountain bikers. 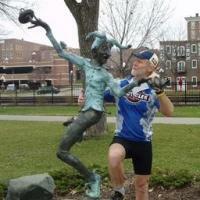 Gary Vernon leading the charge along one of three lakes within the Northwoods Trail System. 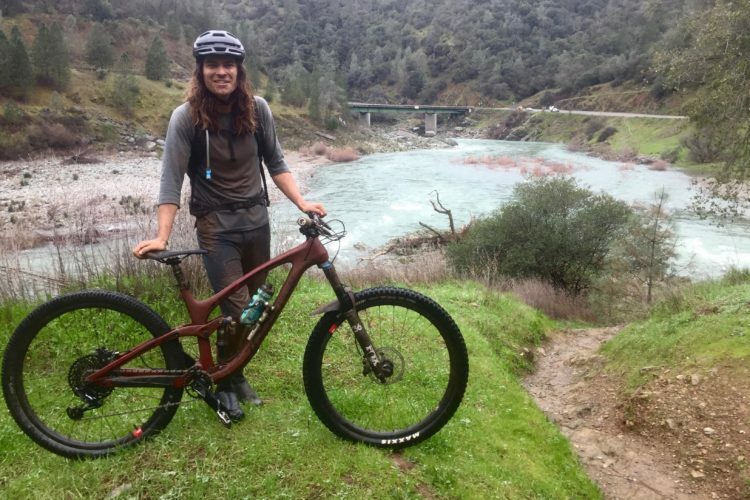 With excitement and frenzy resembling a Black Friday Sale at Walmart, mountain bikers scrambled across the trailhead entrance, eager to experience all the new trails have to offer. As cyclists gathered at intersecting trails they provided beta on what adventure awaited fellow riders on the trails ahead. Although only seven miles of the trail system are open so far, the trails provide a good mix of skill-level challenges. 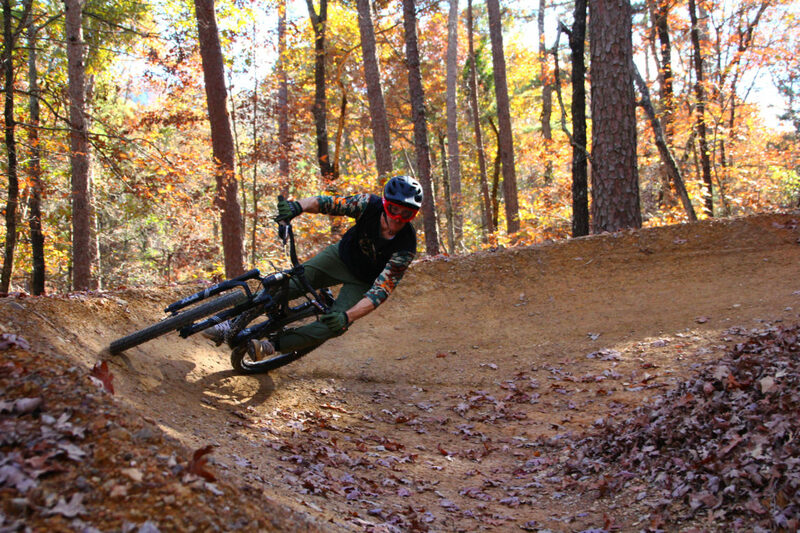 With limited flatland, the wooded hollows and hillsides mean riders are constantly cranking out a steady tempo up very forgiving ascents or flowing down sweet, high banked earthen berms and flying over tabletops. The trails that were open on Friday include two black-diamond runs. 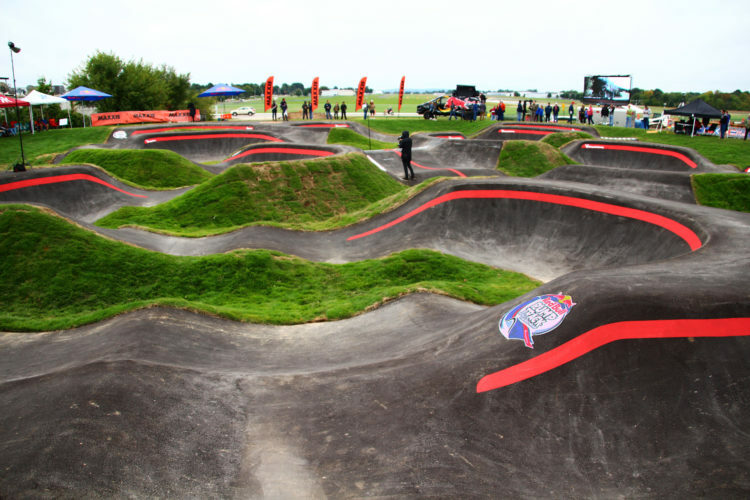 One earned the rating due to the technically challenging rock obstacles, which can be ridden either direction, while the other, Lucky 13, is one-way only — down. The climb to reach the start of Lucky 13 is the only ride that features anything that even resembles a sustained climb. 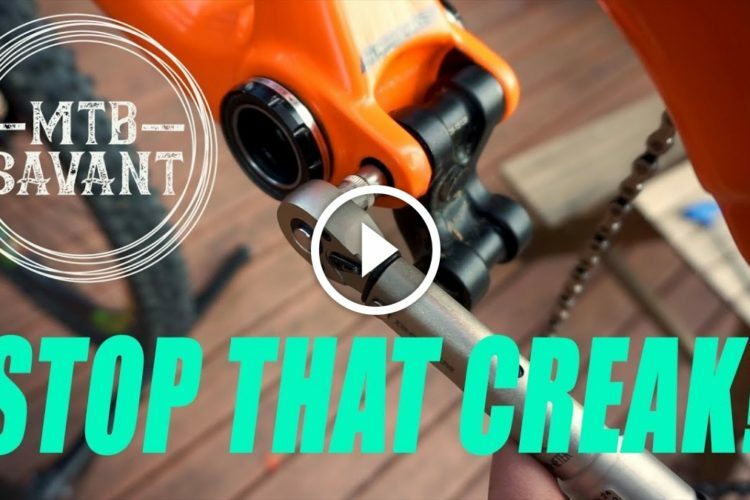 With the expertly-engineered switchbacks to break up the grade, which Trail Solutions is known for constructing, even this doesn’t require too much effort. Once the climb tops out, as riders dips their front wheel onto the beginning of the black diamond descent, it’s boom, boom, boom! 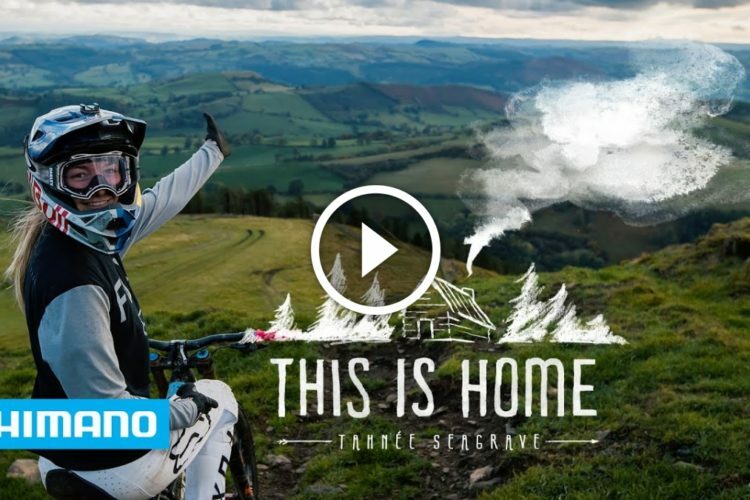 This run features big berms, big gap jumps, big step-ups, and offsetting drops along an entire downhill-feature-laden obstacle course. With the biggest and baddest of the features located in the steepest section of the run, as word spread, both spectators and bikers were soon congregating alongside the trail to watch and cheer on the acrobatics being showcased. Although this was only the first day the trail system had been open, there was already a social path forming where cyclists chose to walk their bikes back up the hill for do-overs on the challenging middle, rather than circling around and back up the trail. 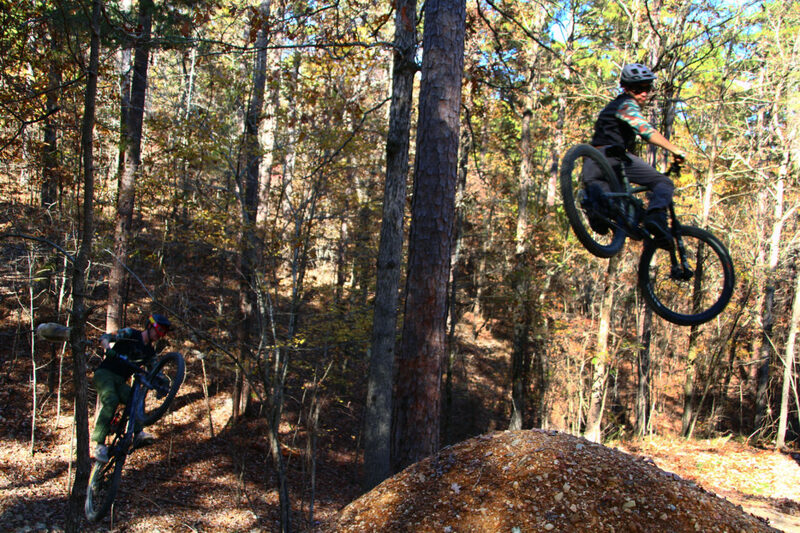 Members of the Trail Solutions crew enjoying the fruits of their labor on a BIG stepup! For those not ready to log big air time on Lucky 13, paralleling the black route is a scaled down blue directional trail, featuring a similar array of features, only on a smaller scale. In truth this trail is already receiving more knobby traffic than the black, but understandably minus the cheering section. 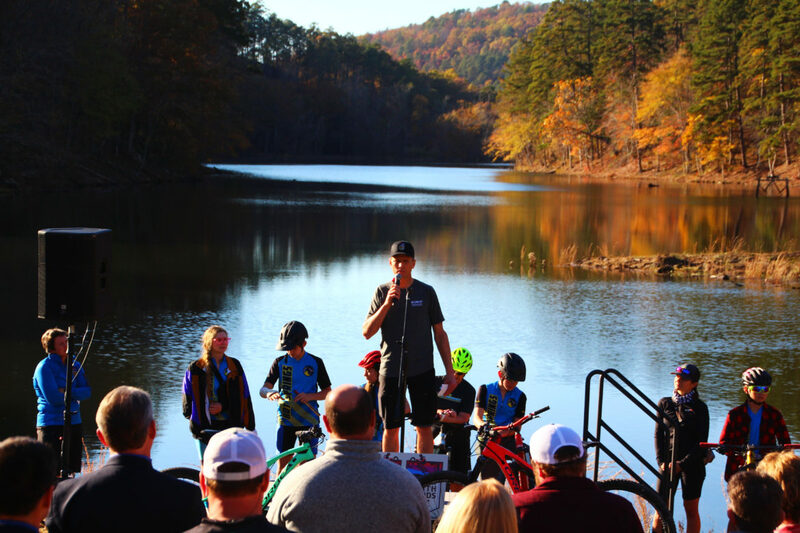 In keeping with the festive atmosphere of the gala event, following a full day of mountain biking adventure, Visit Hot Springs provided live music, food vendors, bike demo rides, and plenty of Arkansas hospitality. Seven of the fourteen miles proposed for Phase I have been completed and were open to the public on opening day, November 17, 2018. Another four miles will be coming online in the next couple of weeks and the remaining trails will be completed by the first of the new year. 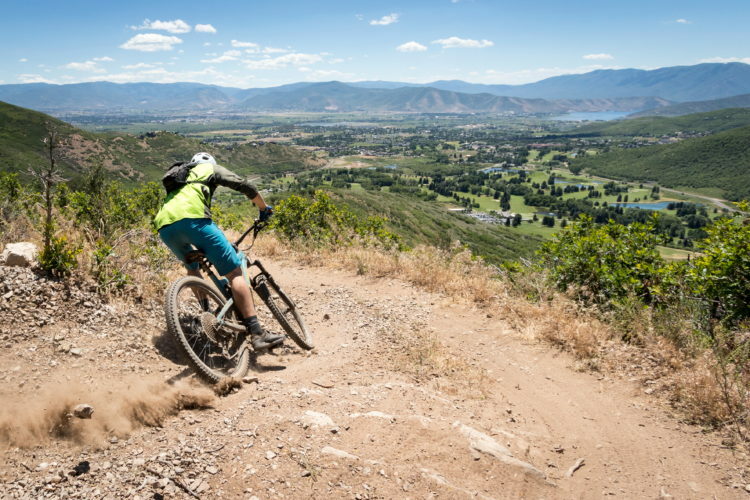 When Phase I has been wrapped up, the Trail Solutions crew will move forward into Phases II and III, for a total of 44 miles of adrenaline-pumping trails. 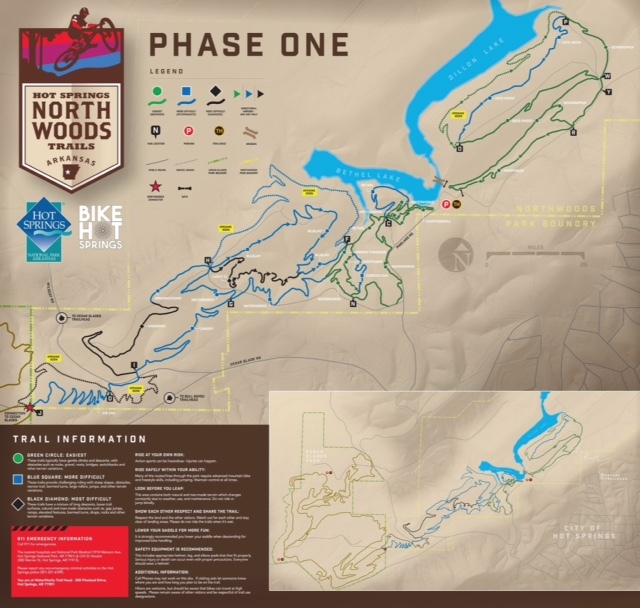 When Phase I is complete, Northwoods will total 14 miles of trail; however, by riding a short connector singletrack you can also bag the Cedar Glades Trails during your visit. 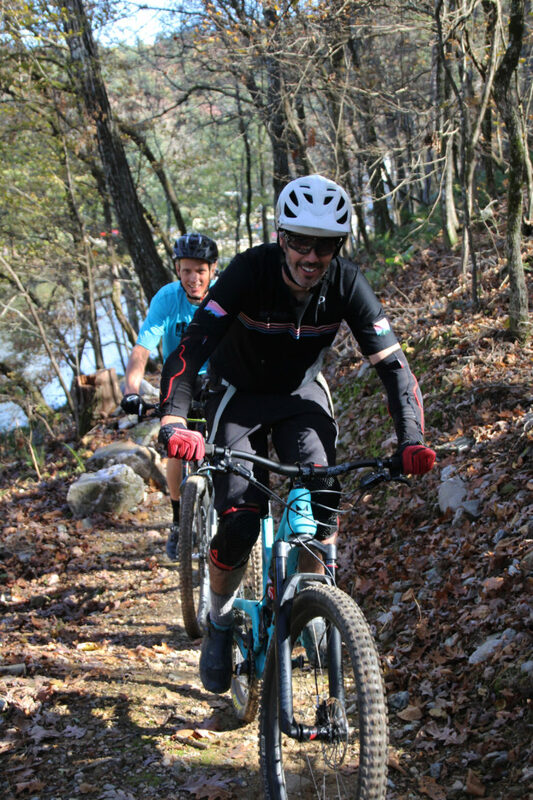 Although Cedar Glades doesn’t offer the challenge of Northwoods, with its 10 miles of old-school singletrack, along with the 14 miles from Northwoods, it will make for a full day of riding for most mountain bikers. 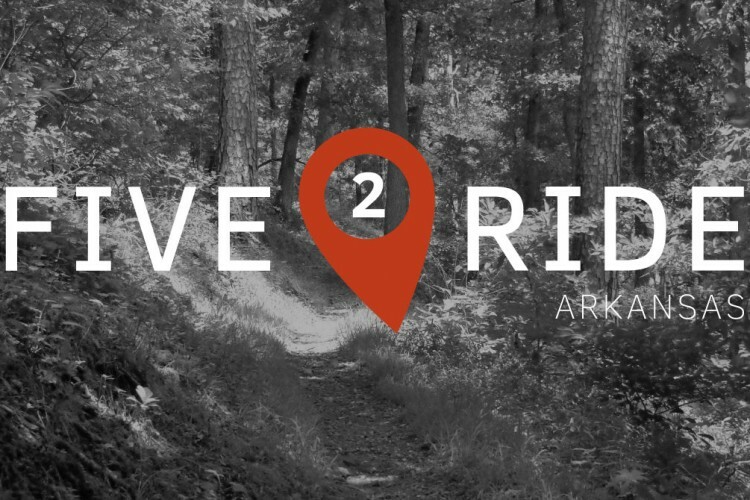 For those cyclists who want more, you are welcome to dish yourself up an Arkansas-size helping of mountain biking adventure on one of the 3 Epic trails that are just a short haul from Hot Springs, using Ouachita Rides & Guides shuttle service. 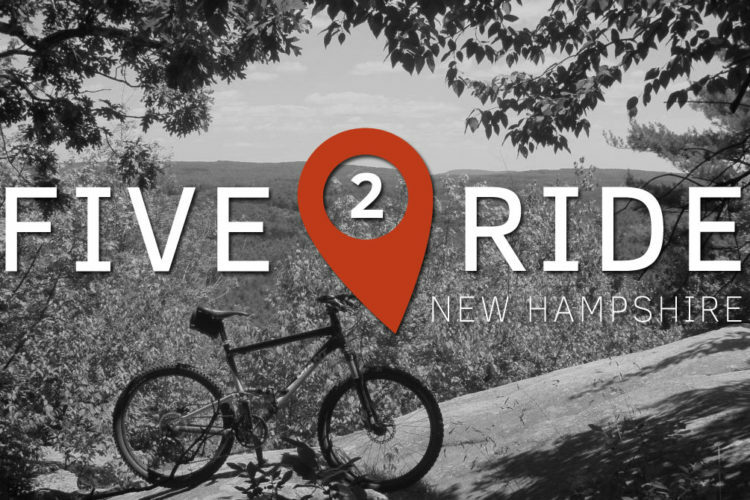 If Phases II and III match the elevated bar set by Phase I, which Traci Berry assures me they will, no matter where you live, if you ride a mountain bike, Northwoods Trails needs to be on your to-do-list. To follow progress of the trail system, visit Northwoods Trails – Hot Springs on Facebook. Anyone within driving distance of Hot Springs should definitely give this place a visit. It’s amazing! Arkansas is just getting more and more attractive.